Jane McIntyre Design is a newly opened lifestyle shop on Southgate Street in the beautiful mediaeval city of Winchester. 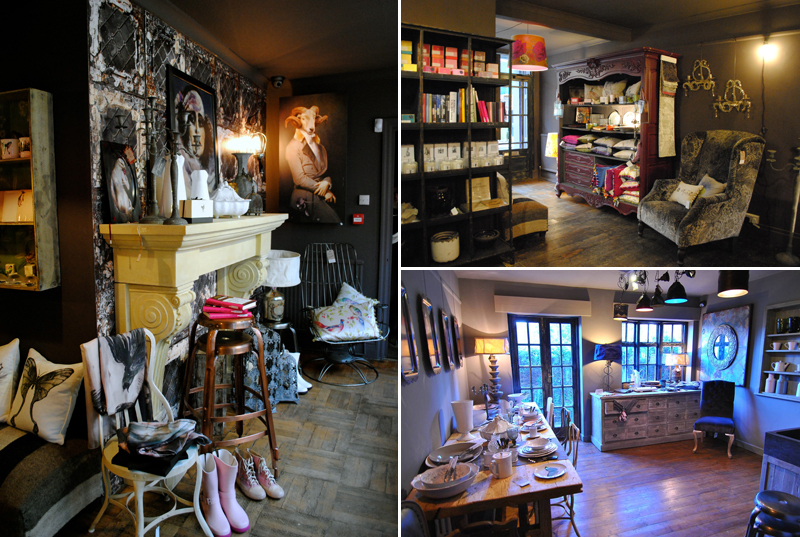 For years a hairdressers, the elegant Victorian space has been completely refitted, combining interior design with a fascinating mix of quirky and traditional finds. The shop is set out as a house but with all things in it being for sale, even the desk Jane works from! Bringing together her years of experience designing houses, hotels, bars and stage sets, Jane has sourced products and fabrics from all around the globe – furniture, lighting, bed-linens, clothes, baths, sinks and works of art along with artisan ceramics, crockery, candles, toiletries, stationary and gifts. She is particularly thrilled to be the only UK and European supplier of the fabulous Bella Notte Linens from California, billed as “the worlds first easy care luxury linens”. Started in 1997 by one woman in the garage of her house, the label has grown into an American phenomenon yet is still family owned and family run. Inherently adaptable, with elements of pure couture, Bella Notte is approachable and inspirational; dressed up or dressed down, modern or vintage, the luscious palette of tones and irresistible textures make this a timeless range. 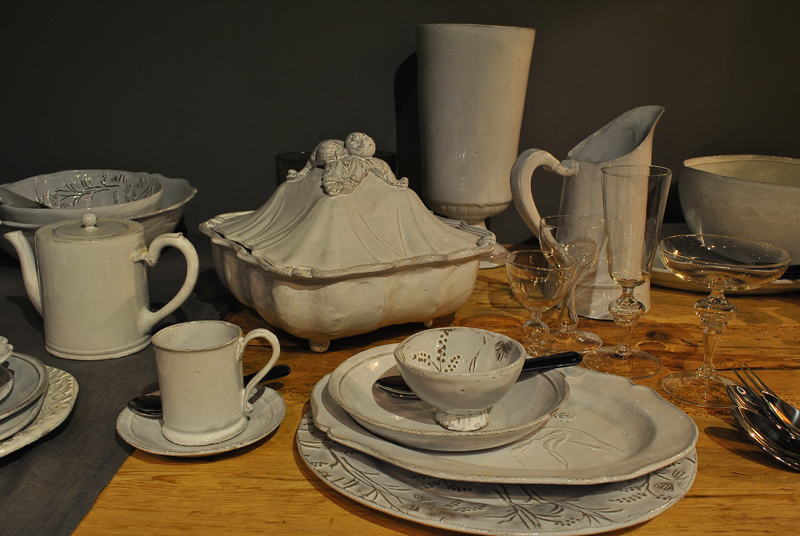 Another coup was getting the famous Parisian ceramics house, Astier de Villate on board. Available at very few places in the UK, notably Liberty of London, Astier has been manufacturing handmade ceramics since1996, following in the tradition of the great Parisian ceramic “ateliers” of the 18th century. Today Astier is the premier and only major ceramics factory to continue the tradition of the old Parisian workshops using ancestral molding and stamping techniques, fallen by the wayside with the advent of industrial manufacture. Their artisanal approach gives each ceramic object the look and feel of a one-of-a-kind; the occasional indentations, rough spots, transparencies and small holes are considered to be qualities that confer authenticity and life to the ceramic pieces. It takes about two weeks to complete the manufacture of a cup and each piece is initialed by its maker. Surprisingly the pieces can be used every day and washed in the dishwasher as long as several precautions are taken to preserve the integrity of the white enamel. Astier also carries a collection of 32 scented vegetable wax candles, each with a delicate aroma of its own, never invasive, perfectly rendered when cold or lit, and housed in effervescent hand blown glass containers. Made by a master chandler in the south of France the candles are 100% natural and pure, without paraffin, GMOs or petrochemical by-products. Another ceramicist being introduced gently to the shop is Valerie Casedo, an artisan potter from Provence, whose ceramics are covered with lace decoration and seem to be glazed with sugar icing. 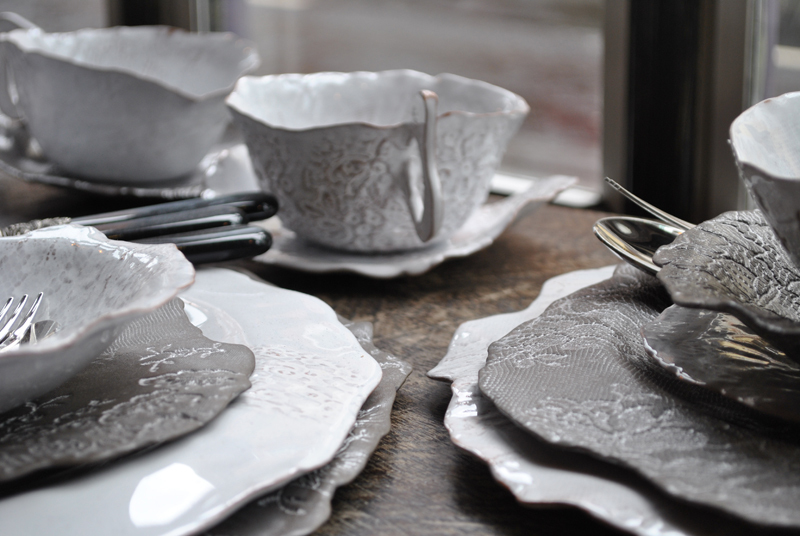 The tableware shows an exciting balance of tradition and modernity, tactile refinement and appetising delicacy. Working alone, she beats and kneads the red clay, rolls it out just like a dough and imprints it with patterns of the most delicate lace, pieces of jewellery and old buttons, Indian print models, bits of embroidery and cabbage leaves, sticks of parsley and buttercups. She turns it then into bowls and vessels, drying them slowly and carefully in the warm French air after glazing them with her own personal mix, so that each piece glows with a unique and iridescent quality. Another of Jane’s favourites are the works of wool artist Jill Harrison. A Yorkshire girl who moved to Scotland to live in a crofter’s cottage with her husband, she needed to find a way to use the fleeces from the Hebredean and Shetland sheep they bred. She began to “draw” pictures with the wool, combing and blending as she went and from early, naive portraits of sheep she has moved to refined works of film stars and pop icons. Check out Jane’s shop for such superstars as Theda Bara, Vivien Leigh and Clara Bow. Locally, Jane has teamed up with Alresford illustrator Suzie Brown who produces intriguing lampshades printed with blowsy flowers in sublime colours with a retro feel, or pristinely executed fantasy horses in black ink charging across a landscape of muted earth colours. Available in a dizzy array of shapes and sizes these shades are sure to be a talking point in any room they care to grace. There is definitely a buzz about this shop. 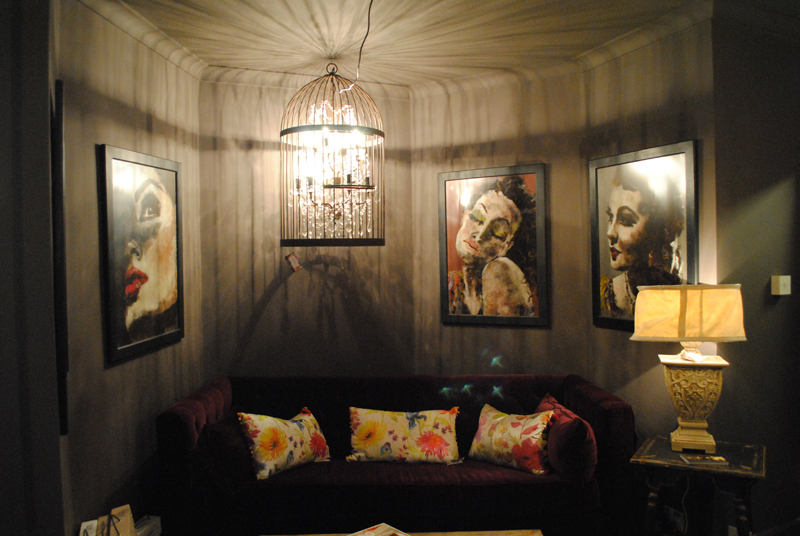 A bit of an Alladins cave, the customer is often amazed at the slight decadence of the dark colours of the main room, teamed with velvet sofas, muted lighting and a selection of unusual wallpapers – Jane is an agent for the Merci “Brooklyn Tins”, Piet Hein Eek “Scrapwood” and Elli Popp wallpapers, highly covetable, and the Dutch chalk paint from Pure and Original. 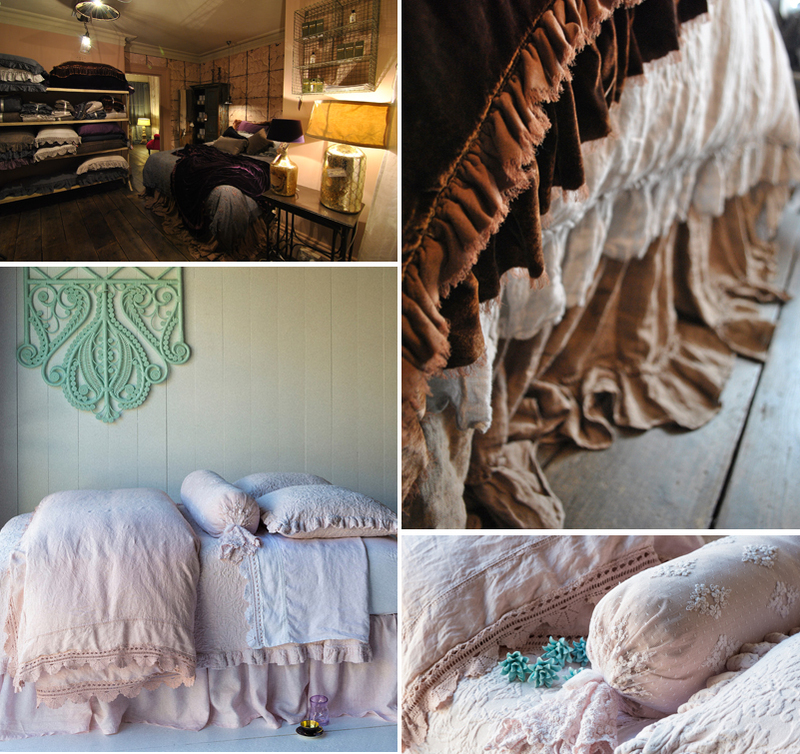 In contrast, the upstairs rooms are light and airy, showing the bed linens to their best advantage, with the addition of a gorgeous tin bath from William Holland – it’s really copper, just coated in tin, so while looking like it’s stepped straight from the Prairie it is in fact only masquerading. There’s more, but one needs a little bit of surprise now and then. Why not pop in and meet Jane and test run the experience for yourself. Number 11, Southgate Street, Winchester is awaiting you!